I’ve long been obsessed with a tropical member of the Mint family Labiatae and focused on obtaining some plants of it to grow in my fragrant garden. They were harder to find than I imagined, but I got two in small pots about a year and a half ago. You can read more about them here. These plants are as aggressive in their growth habit as mints; instead of growing horizontally via runners, they grow vertically, leaping skyward at an astonishing rate. I don’t fertilize them, and they don’t have any pests or diseases. On a sunny Sunday in Miami, Angie and Julia showed up to harvest them and we worked together on the distillation of the big, soft, velvety, fragrant leaves. The leaves smell like a combination of balsam, tobacco, mint, and sweetness. This photo gives you a sense of the size of the leaves: “grandifolia” for sure. Some are as big as your head, most will cover your hand, even with fingers outstretched. Once the branches were harvested, they were brought immediately inside, and the leaves were stripped off of them, and torn into pieces. From harvest to distillation pot, approximately a half hour. Cornutia is amazing: no insects, no diseases, very healthy foliage. We did find one ladybug who hitched a ride inside! Angie and Julia starting to process the leaves for the distillation pot. It soon got serious and focused, with the three of us around the table. We then weighed the leaves, and got over four pounds for the hydro pot and the steam column. Angie kept meticulous records throughout, and she is still refining the record sheet to adjust it as we learn more of the process. So the retort (hydrodistillation pot) and the steam column were packed, and we used Ann Barker Harmon’s book Harvest to Hydrosol as a guide, finding the ratios of water to plant material very helpful. The beautiful 20L copper alembic is from The Essential Oil Company, and is adaptable for either hydrosol or essential oil production. It’s the minimum size required for essential oil, as the yields of that are typically very low, so you need a critical mass of plant material to get some. We were happy to get hydrosol, because distillate waters have a beauty and magic all their own, and we wanted to explore this rare plant’s hydrosol. There is an overuse of the sealing tape, because we’re beginners and were nervous about steam escaping, but we’re pretty happy about the set up for the distillation itself, and have captioned it to help convey the logistics of the process. One correction: the arrow for “warm water out” should be pointing in the opposite direction of the “cold water in” arrow. It flows from the top of the condenser back to the ice chest where it is cooled again. We were so excited when the hydrosol started dripping into the jar, I had to remove the sound from the video! 🙂 Anyway, this may be the first-ever video of Cornutia grandifolia being distilled in the USA. This is my first attempt to embed a youtube video into a blog post, I hope it works. 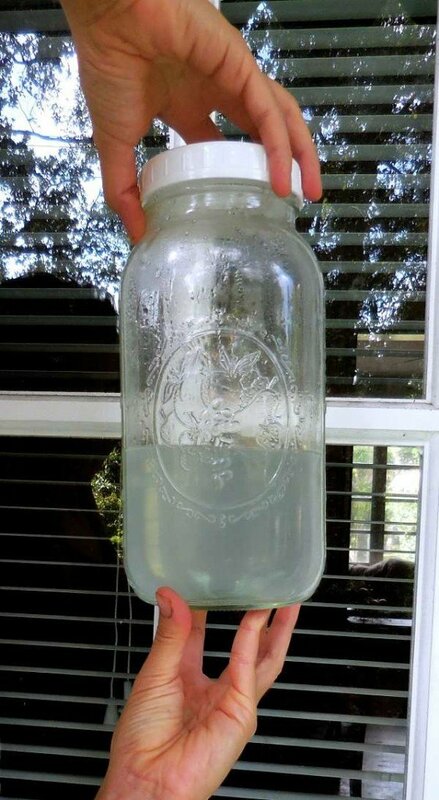 The first part of a hydrosol that appears is called the “head”, and it is typically very beautiful, sweet, perhaps full of esters. Not only did the Cornutia fill that description, it was the palest of silvery blue. I was wondering if it might contain chamazulene, the antiinflammatory agent in Roman Chamomile. The undersides of the leaves are silvery, and maybe the blue is present because of the blue flowers – which we did not distill, but might be present in other parts of the plant. After I posted about this on Jeanne Rose’s Hydrosols group on Facebook, she informed us that the flowers are mixed with lime(stone?) in France to make a blue ink. The “head of the hydrsol captures the sweetest, prettiest notes. 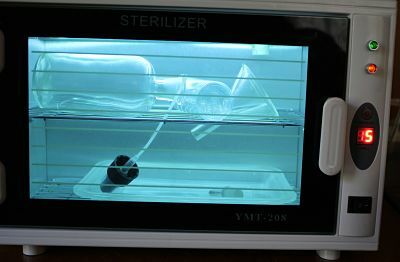 We then switched to another sterile jar, and go the “body” of the hydrosol, and all the time, including while the “head” was processing, we were chatting about the scents we were observing coming from the still. Artichoke, ghee, floral, tobacco, mint were the first observations. Then in the “body” the artichoke receded a bit, and a balsam scent came through. I think we were a little perplexed, because we had never smelled anything like this before. We all agreed that the fragrance was strong, and an analogy could be made that it was a big and powerful looking as the plant and leaves. I feel the hydrosol could be used in perfume, a tiny bit added to round out and give a complex, beautiful note. When we detected that the scent coming out of the distillation was going flat, we knew we had reached the “tail” or end of the great-smelling distillate.The hydrosol was now finished, so we turned off the gas, capped the jar, and began the process of disassembling and cleaning the still – no easy task! Angie and Julia were so helpful, I can’t thank them enough. 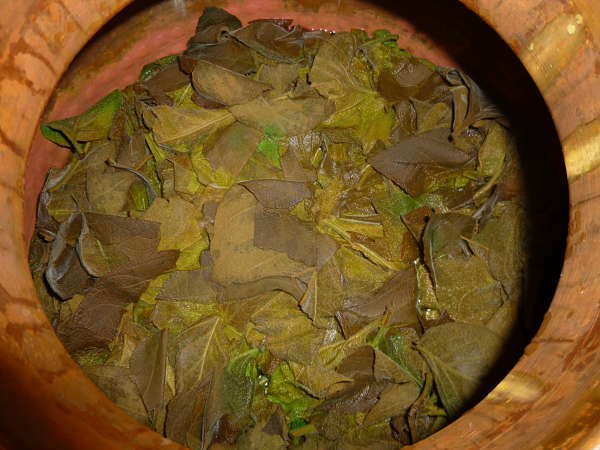 The spent Cornutia leaves after the distillation is over. Looking down into the retort pot. We were surprised at the green leaves that survived the heat. Ann Harman’s book has instructions for evaluating the marc, how to examine the texture and look of the plant material, and despite the few odd green leaves, the marc fit the description of what it should look and feel like. You also have to examine the marc in the column, the part that was steam distilled. There were no dry spots, no areas where the steam did not pass through, so we felt pretty good about the project. We now have almost two liters of “body” hydrosol distillate, and slightly less than one pint of “head”. We all took samples of the “body” to evaluate as it slightly aged. Over the course of this week, the artichoke has disappeared, and some sage notes, and then black tea notes (it even smells like sweetened iced tea!) have emerged along with floral, balsam, and others that are hard to define. No, no essential oil. Perhaps like the other Mint family plant that yields *very* little essential oil – Lemon Balm – this plant is to be prized for its hydrosol. What are the medicinal properties? Good question. Angie Gonzales is an Ayurvedic practitioner and she will be delving into the large body of Spanish language written materials on this plant . It’s an ancient, powerful medicinal plant, and there have been a number of studies done on its medicinal properties in Central and South America. Since it was used by the Mayans, and Angie is from Mexico, she feels a special affinity for it. We will be reporting more on this wonderful plant in the future. Subscribe to this blog to be informed when we update it regarding Cornutia. 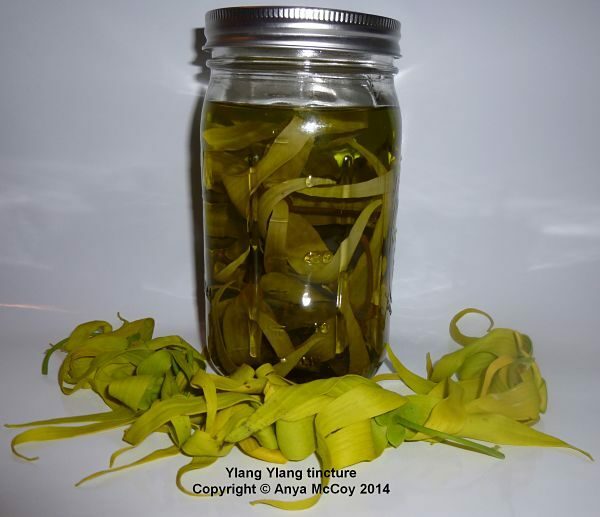 This entry was posted in Anya McCoy, Anya's Garden Perfumes, Healthy perfume, Herbalism, Hydrosols, natural aromatics, raw materials of perfumery and tagged cornutia grandifolia on October 29, 2015 by Anya. I haven’t had a cold or flu since I was 20 years old. For the previous five years, I had been using essential oils and fresh herbs on a daily basis. Oils to anoint and herbs for food and sometimes medicinal purposes. I remember being shocked to read that one tablespoon of parsley would supply the daily requirement for Vitamin A. The oils supplied my daily need for beauty and the other world of natural fragrance that I adored. Of course, the health benefits of herbs and fragrant plants have been known for thousands of years, and the first healers were also perfumers, adept in the arts of incense and fragrant oils. The last century saw the art of aromatherapy introduced to the modern world, a systematic approach to using essential oils for healing. 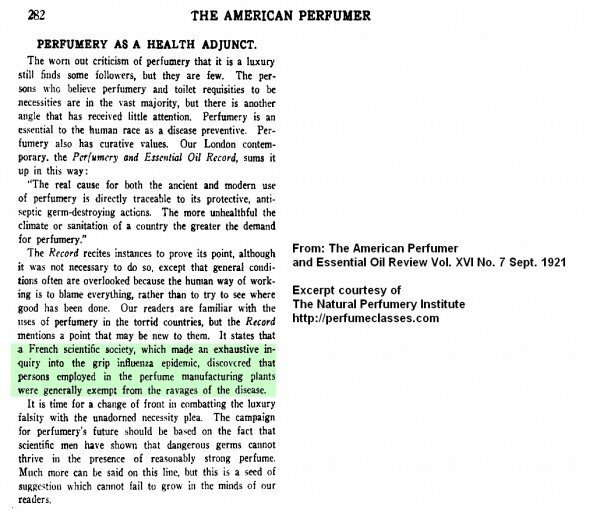 But rarely have perfume journals, the professional publications of the perfume industry, addressed the healing and prophylactic power of natural aromatics. So, Were The Workers in Perfume Supply Houses Protected From the 1918 Influenza Epidemic? Those workers were extracting only 100% natural materials: rose, basil, jasmine, cardamom, vetiver, etc. They were benefiting from the protective (prophylactic) benefits of the volatile essences of these plants! There are many new, independent perfumers using either 100% naturals, like myself, and others who use mostly naturals and some synthetics. I have found the indies use much less synthetics than the “big houses”, so maybe they’re more in line with the perfumers of the 1920s. That is, perhaps they can, and their customers can, benefit from the naturals they use in high percentage. Most, if not all, of the naturals used in perfumery have been used, at least in the form of raw plant materials, or infused oils, as medicine by the indigenous peoples of the world. To continue the tradition of using plants for healing, and beauty, is to continue the tradition of looking to our environment’s beneficial offerings. 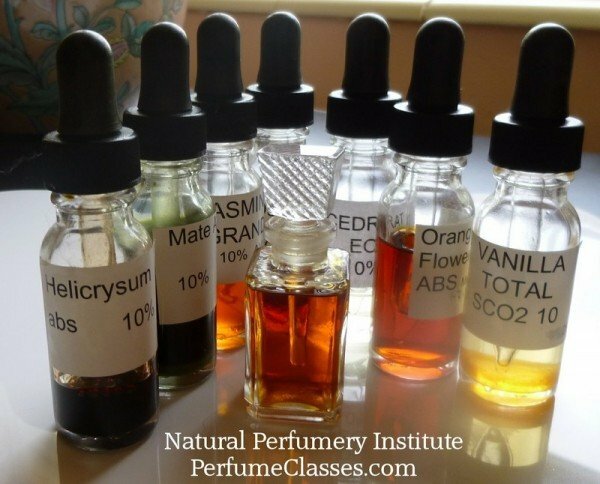 My perfumery course is something I am most proud about in my professional life. 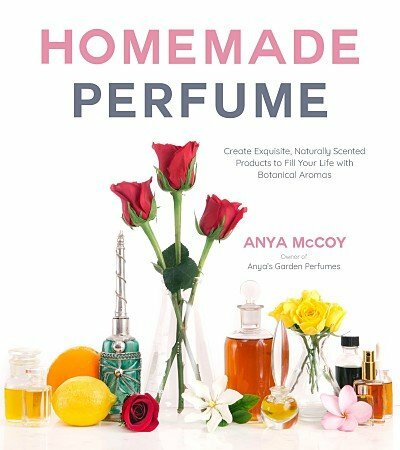 Yes, I’ve made award-winning perfumes; yes, I’ve nurtured hundreds, if not thousands of aspiring perfumers in the Yahoo group; yes, I practice organic gardening and love to extract the fragrance from the plants in my garden – but teaching professional, modern ways to work the beautiful, healthy essences into natural perfumes is what I love the most. Do you want to take my course? Email me, let’s chat. 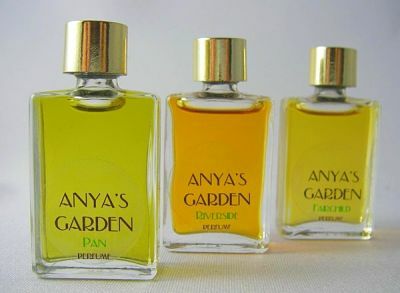 This entry was posted in Anya's Garden Perfumes, Healthy perfume, Herbalism, raw materials of perfumery, study perfumery on May 8, 2014 by Anya.